While the advance party secured Atsugi airstrip and made arrangements for the landing of additional troops, the 11th Airborne Division on Okinawa prepared itself for airlift to Japan. Its first echelon began landing at Atsugi early on the morning of 30 August, and troop and cargo-carrying aircraft continued to arrive at three-minute intervals throughout the day. 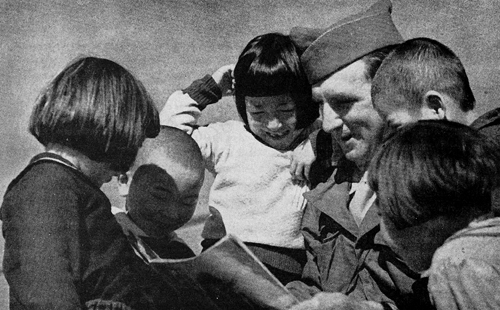 upon landing at Yokosuka, the Marine forces came under the command of General Eichelberger. Hardly had the Marines established themselves when an infantry patrol from the 11th Airborne arrived from Atsugi to effect contact. The liaison patrol was from the 511th Parachute Infantry of the 11th Airborne, a unit which, after landing at Atsugi, had moved eastward to secure the Yokohama dock area in preparation for large scale amphibious landings in that vicinity. 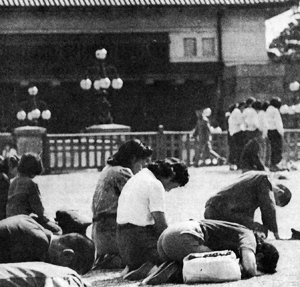 Near the administration building on the far side of the Atsugi airfield, some anxious-to-please Japanese armed guards were saluting every American who passed within yards of them. Meanwhile, regiments of the 11th Airborne were establishing their headquarters near the airfield. Units of the forward echelons of GHQ and Headquarters, Fifth Air Force, were arriving by plane and were loading equipment to be used for an operating headquarters into the nondescript trucks which the Japanese had assembled. "Manpower" was as important as "horsepower," as one after another of the worn-out vehicles broke down on the road between Atsugi and Yokohama. For the first time, the occupying forces could see for themselves to what straits the Japanese nation had been reduced by the prolonged and exhausting war. 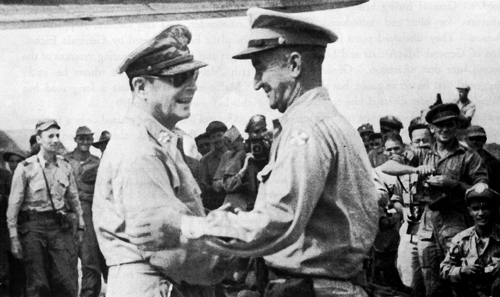 General Eichelberger greet General MacArthur at Atsugi airfield. waiting automobile to go on to Yokohama where temporary General Headquarters were being established. 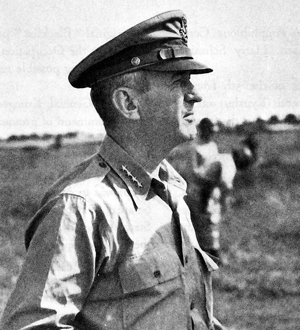 General Arisue had assured General Swing that requirements presented to the Japanese emissaries in Manila had been fulfilled and the route was safe.10 The fifteen miles of roadway between the airfield and the New Grand Hotel were lined with thousands of armed Japanese soldiers and policemen. They stood at attention but faced away from the road, an additional security measure which was customarily used only for the movements of the Japanese Imperial family. In spite of these elaborate preparations, the Americans took no chances. The Honor Guard Company of the 3d Battalion, 188th Para-glider Infantry, had taken the precaution of guarding the entire length of the Atsugi-Yokohama road. Units of the forward echelon of GHQ managed to move most of their equipment to the Yokohama Customs House for the establishment of GHQ. But before unpacking was thoroughly under way, orders were given to unpack only the essentials needed to carry on for a few days. It was General MacArthur's intention to move his staff and his headquarters to the capital itself as soon as reports had been received on suitable sites for billets and offices. Eighth Army Headquarters staff likewise set up a temporary arrangement preparatory to moving into the Customs House which it was to occupy when GHQ transferred to Tokyo. By the end of the day, 4,200 troops and 123 planes had completed the move from Okinawa.11 Weary troopers dropped their gear in assigned areas and the rattle of mess kits replaced all other sounds. It was a peaceful sound and one which few men of the 11th Airborne Division had expected would characterize their descent upon the home soil of Japan. The weather turned against the Occupation plans during the night. Okinawa dispatched only eight airloads for Atsugi airfield; nevertheless, this lift was sufficient to bring forward the remaining elements of the 511th Parachute Infantry, and the regiment was able to establish its command post that day in Yokohama. There were now more than 2,000 occupation troops within the confines of the city. tion on the east side of Tokyo Bay. It was anticipated that this area would be occupied by the 112th Regimental Combat Team. To prepare for this, the Marine unit planned a reconnaissance of the whole area on the following day. The Japanese had been repeatedly told through official communiques during the course of the war that American naval strength had been reduced to impotency. Consequently, the tremendous collection of seapower anchored in Tokyo Bay in preparation for the official surrender ceremonies must have been a shocking and sobering sight.16 By evening preparations were complete for the ceremonies which were to take place at 0900, 2 September 1945, aboard the USS Missouri. General Umezu, on board the USS Missouri in Tokyo Bay. the Surrender Document. In the rear of the Supreme Commander stands Lt. Gen.
Jonathan Wainwright, defender of Corregidor until its fall in May 1942.
requirements which had been outlined to the Japanese emissaries at Manila two weeks previously. The order called upon the Imperial General Headquarters "...by direction of the Emperor and pursuant to the surrender to the Supreme Commander for the Allied Powers...", to order the Japanese forces to surrender themselves and their arms to designated representatives of SCAP in various parts of the Pacific Theater and China.20 The Japanese police force was initially exempted from the general disarmament and was ordered to remain on duty for the preservation of law and order, for which it would be held responsible. The Japanese Government was directed to provide detailed information about the armed and economic resources of the country. The safety and well-being of prisoners of war and civilian internees was specifically demanded and all pertinent records were required immediately. The Japanese were to be prepared to deliver all such persons to Allied authorities. To permit maximum concentration upon the immediate occupation problems in the Japanese main islands and Korea, responsibility for implementation of surrender and subsequent operations in all other Pacific areas was considered outside the province of SCAP. The following commands were dissolved: Allied Land Forces, Allied Naval Forces, and Allied Air Forces. For surrender purposes the British Empire assumed control of certain portions of the Southwest Pacific Area, the Netherlands East Indies, and Australian and New Zealand Forces in the East Indies, south of the Philippines and Manus Island. I. Nothing was disseminated prejudicial to public order and safety, including criticism of surrender terms and Allied control measures. 2. No suggestion was imparted of disunity in Allied Powers policy toward Japan. 4. No promises were attributed to Allied Power, excepting basis of direct textual quotations from official documents reported without comment or interpretation. 5. Files of all publications were maintained for Allied inspection. Eighth Army assumed responsibility for the Area of Initial Evacuation but functioned through the Japanese Government. The task of allocating areas, facilities, and equipment to occupation agencies was also placed under its jurisdiction. The only exceptions to this arrangement were the Yokosuka Naval and Air Bases which were assigned to the Navy. Boundaries were later fixed by agreement between the Eighth Army and the Navy. The Eighth Army Commander allocated the Atsugi airdrome and surrounding territory to the Far East Air Forces, and made available to General Headquarters those facilities requested through its representatives. To facilitate the Occupation of Japan by the two United States Armies, this Directive specified that the boundaries of the First Japanese Army (Group) would be adjusted to coincide with those of the Eighth U.S. Army. 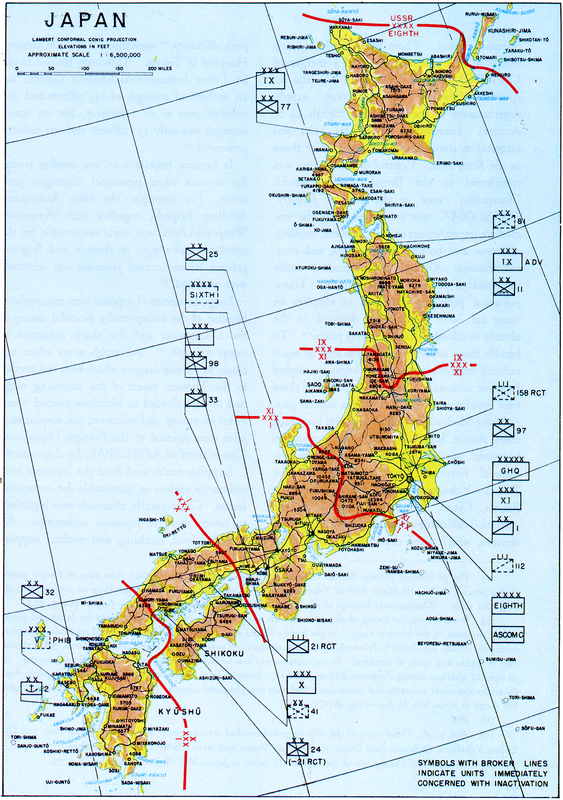 Similarly, the boundaries of the Second Japanese Army (Group) would coincide with those of the Sixth U.S. Army. As specified by the Directive, the Commanding General of the First Japanese Army (Group) reported to General Eichelberger for instructions. General Eichelberger directed him to notify all Japanese military commanders and civilian officials that, beginning with 6 September, they could expect United States reconnaissance parties to travel throughout their areas. Following this, the occupying troops would move in. Seventy-two hours' advance notice of a reconnaissance party's arrival in a particular area and forty-eight hours' notice of the movement of troops would be given. These detailed arrangements would permit the Japanese commanders to disarm their units prior to arrival of occupation forces and to restrict them to barracks or camp areas, thus reducing the possibility of any clashes. The Commanding General of the Second Japanese Army (Group) reported to the Sixth U.S. Army Commander. At the same time, a senior representative of the Chief, Japanese Imperial Naval General Staff, reported to a designated naval representative for instructions covering the entry of United States naval forces into Japanese and Korean waters and naval establishments. The 112th Cavalry Regimental Combat Team landed at 0930 on 3 September near Tateyama Bay naval air station and established control over coastal defenses. Immediate contact was made with the 11th Airborne Division reconnaissance troop which was patrolling north to Chiba and south to Tateyama. Control of the 112th Cavalry RCT passed to the 11th Airborne Division. 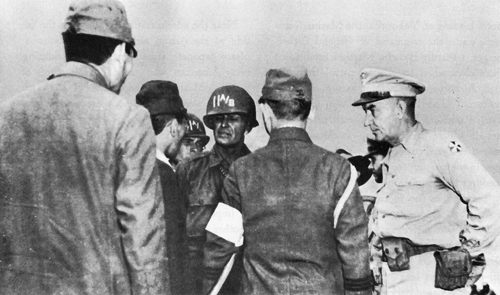 No hostile military or civilian action during period as 112th RCT landed Tateyama where 1,600 armed troops were reported: Jap Army, Navy and State Dept officials met our forces and agreed to stipulation of the surrender. 11th A/B Div and Fleet Landing Force continued to patrol area of responsibility with no reported unusual incidents. CIC Detachment and Japanese Civil Police completed investigation of 2 Jap civilians found dead vicinity Grand Hotel, Yokohama, 1 Sep. Japanese Police satisfied deaths not result any American action. While the Emperor was addressing the Japanese people, Lt. Gen. Charles P. Hall's XI Corps Headquarters finished unloading and opened in Yokohama. The 8th Cavalry Regiment (1st Cavalry Division) passed to control of the Commanding General, XI Corps, and relieved the 11th Airborne Division of guard duty on the perimeter along the inner Yokohama Canal and at vital installations in Yokohama proper.34 The 12th Cavalry Regiment moved to the Tachikawa area, west of Tokyo, and occupied Chofu, Yokota, Showa, and Tachikawa airfields, completing United States control of all important airfields on the Kanto Plain.35 Meanwhile, elements of the 11th Airborne continued to arrive at Atsugi despite unfavorable weather. Service troops of the Far East Air Forces and the first battalion of the 127th Infantry (32d Division) landed at the Kanoya airdrome on 4 September. 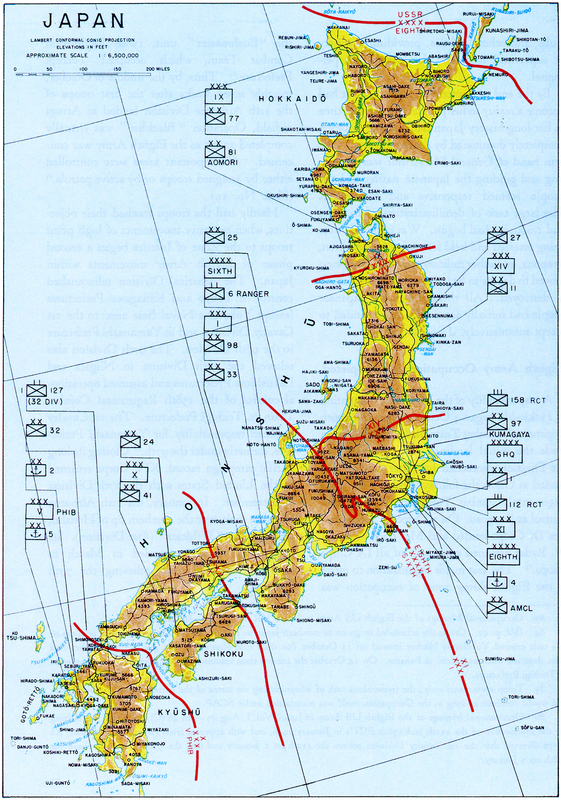 They occupied the area south of Tokyo.36 On 5 September, reconnaissance parties from the XI Corps and 1st Cavalry Division penetrated Tokyo in preparation for the main movement of troops planned for 8 September. The 1st Cavalry Division thus claimed to be the first unit in Tokyo. between Luzon and Okinawa.37 Troop carrier planes began moving elements of the 27th Division.38 By evening of 7 September the air movement of the 27th Division from Okinawa to Atsugi had assumed sizeable proportions. Approximately 25 percent of the strength of the 105th Infantry Regiment had arrived. The forward command post of the Division closed at Okinawa and opened at Hiratsuka. 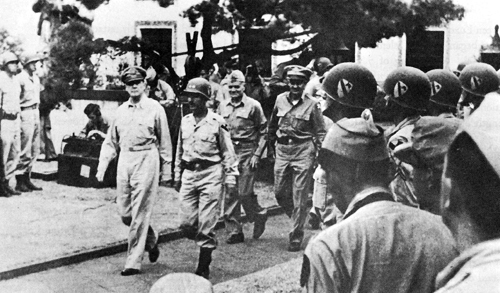 The initial landing at Atsugi was the first occupation of Japanese soil by American troops. However, the event which was to symbolize the real defeat of Japan was the entry of the Supreme Commander and his forces into Tokyo, the final step on a long trail. At 0800 on 8 September a motor convoy left the assembly area of 1st Cavalry Division at Hara-Machida and turned toward Tokyo. Among other vehicles was a jeep which carried General Chase, the Division Commander. Unfortunately for all those of the Division who had so thoroughly earned the right to be "first" in Tokyo, the bulk of the Division was carrying out occupation duties and not many units could be spared for the mission. Only the band, the second squadron of the 7th Cavalry Regiment, the 302d Cavalry Reconnaissance Troop, and one veteran representing each of the other non-participating troops were included for the formal entry. 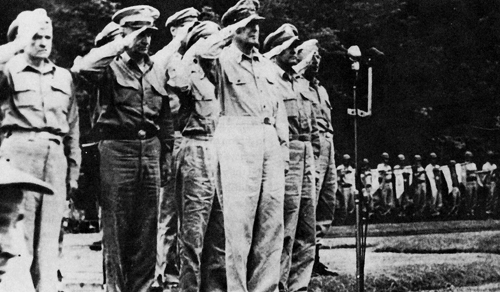 A few hours later, at a simple ceremony in front of the American Embassy, General MacArthur gave the following order to General Eichelberger: "Have our country's flag unfurled and in the Tokyo sun let it wave in its full glory, as a symbol of hope for the oppressed and as a harbinger of victory for the right. "41 The guard of honor presented arms and the officers saluted, as the Stars and Stripes waved over Tokyo, Japan's capital city-humbled, charred, and flattened in defeat. official raising of the American flag. Salute to the flag in the American Embassy grounds. 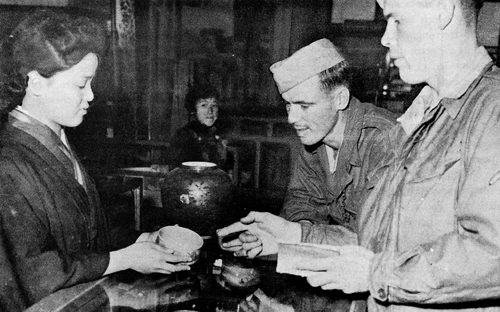 With the United States troops in Tokyo, the Occupation became an accepted fact to the Japanese people. There were no hostile or subversive moments, only a curious interest on the part of all classes of Japanese as new units moved through the streets of Yokohama and Tokyo. The Japanese press in general maintained an attitude which was almost that of a host. With the exception of the 8th and 12th Cavalry RCT's, on security duty in the Yokohama-Tachikawa area, remaining units of the 1st Cavalry moved from Hara-Machida into Tokyo on 9 September. The Americal Division continued its debarkation during 9 and to September and established its command post northwest of Hara-Machida. Nearly all of the division artillery was established in the Yokohama area, while more than 60 percent of the 164th Infantry was billeted in the vicinity of Tachikawa. Good weather had favored large-scale air movements from Okinawa and seventy-four planes arrived at Atsugi carrying personnel and equipment of the 27th Division. The regimental headquarters of the 105th Infantry had been established at Odawara and rail transportation had been marshalled for the movement of the incoming troops on 10 September.44 On the same day Task Force 35, bearing Eighth Army representatives, entered Katsuyama Bay on the Uraga Peninsula east of Tokyo, and a landing was made at Katsuura. Considerable army and navy equipment was found in good condition and no incidents were reported. By to September primary security duties were taken over by the Americal Division which, with the exception of a battalion of the 164th Infantry, had completed unloading and moving from the docks. Elements of the Division relieved 1st Cavalry units on duty in Tachikawa and Chofu airfield areas and in the Yokohama area. At Hara-Machida the 182d Infantry of the Americal Division replaced elements of the 11th Airborne which was to be transferred to Sendai. Soon thereafter the advance party of the 11th Airborne departed for Sendai. The air movement of the 27th Division from Okinawa went on without interruption during the day, while the 105th Infantry, which had arrived earlier, moved by rail from Atsugi to Odawara. Meanwhile the 106th opened a temporary command post at Zama. had proceeded so well that shipments of all combat elements of Corps troops (except combat engineers) were cancelled. With the exception of the 158th Regimental Combat Team, which was scheduled to occupy Utsunomiya (northwest of Tokyo) in October, Eighth Army's occupation of Honshu was virtually completed by the end of September. The main and supporting movements had taken place with smoothness and dispatch, something that had not been anticipated. Not one serious incident marked the movement of thousands of Eighth Army troops into Honshu. All areas were under firm control. Units of the IX, XI, and XIV Corps carried out their missions without trouble. They operated routine security patrols, seized and secured critical Japanese installations and made local checks on the demobilization of the Japanese armed forces. The progressive destruction of enemy ammunition and materiel was also supervised. In a surprise move at the end of the month, troops and CIC units established guards over all Japanese financial institutions and strong rooms. The banks were closed, pending a detailed inspection by SCAP technical experts.58 In the midst of these activities the 43rd Division, the first to be returned to the Zone of interior, sailed from Yokohama on 28 September. was assigned to the V Amphibious Corps commanded by Maj. Gen. Harry Schmidt, USMC. Headquarters Sixth Army landed at Wakayama on 25 September and opened at Kyoto two days later. Two of the three divisions of I Corps, the 33d and the 98th, arrived on 25 and 27 September respectively.61 The 32d Infantry Division was not scheduled to move from the Philippines to Japan until October. When General Krueger (Sixth Army) assumed command of ground forces in the zones of responsibility of V Amphibious Corps and I Corps on 24 and 27 September respectively, he established his headquarters in Kyoto. I Corps was to control the Osaka-Kyoto-Kobe area; X Corps, the central portion of the Sixth Army Zone; and V Amphibious Corps, the extreme southern part. a visit with the Supreme Commander. American magazines and newspapers were quite antagonistic, claiming that the statement had been made for effect only and was not in the best interests of safety. Nevertheless, the "man on the ground," the American soldier, was inclined to believe it. Calming a nervous populace called for discipline and friendliness. General MacArthur's troops proved themselves equal to the task. American personal kindness and official consideration were wholly unexpected by the Japanese. Those factors went far toward building good relations with an emotionally disturbed people. Beginning with the first hours of the Occupation, the old authoritarian background of the Japanese contrasted with the free, liberal philosophy of the American forces. Adjustments had to be made and sometimes led to misunderstanding and confusion. Japan, accustomed to close control from the top and always indifferent to independent thinking from those in lower strata, had no criteria by which to initiate or to judge the value of the original measures so strongly desired by the occupation authorities. Adjustment, however, proved far less difficult than had been anticipated. This was partly due to the apparent eagerness of the Japanese to adapt themselves to occidental methods, although a great deal of credit must be given to the shrewd advance planning of General MacArthur. Japanese ideas of how their conquerors would react once Japan was occupied were based on former Japanese Army policy in the conquered Asiatic and Pacific Ocean areas. In those areas the native populations, regardless of their own food shortage, were always expected to feed the Japanese troops. Mindful of their army's policy and in anticipation of food requisitions by the Occupation forces, the Kanagawa prefectural authorities laid in a store of onions, potatoes, fruit, and meat. Since all intelligence surveys had correctly reported an acute shortage of food in Japan, Occupation personnel expressed considerable surprise at this abundance. When a member of the reception committee explained that the food had been "requisitioned," one of the United States officers made it clear that no such special consideration was desired. This attitude, wholly at variance with Japanese Army practices abroad, produced an immediate, favorable effect upon Japanese public opinion. The Japanese were further impressed by early reports of tolerant treatment of the Japanese by our soldiers. The friendly boyishness of the new arrivals who, when strolling along the Ginza for the first time, polled the numerous street stall eating places to ask for milk70 amused the Japanese and eased the tension. 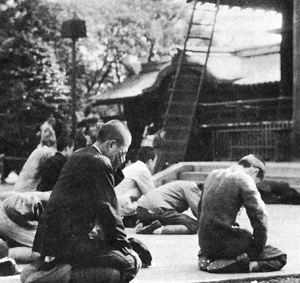 These minor incidents exemplify what appealed to the "face saving" tradition-bound nature of the Japanese people. To forestall any incidents which might be caused by exuberant, irresponsible soldiers seeking souvenirs, all commanding officers were instructed to take necessary precautions. Considering the fact that the majority of occupation troops were combat veterans, relatively few incidents marred the initial occupation. 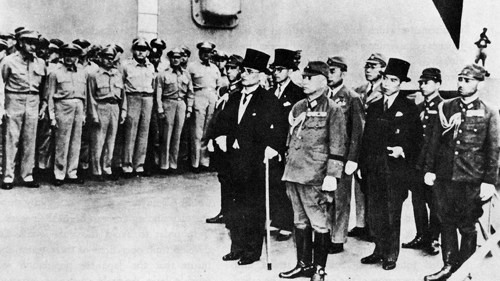 The Japanese received the victors submissively following the Emperor's mandate. They had accepted the Americans cautiously and were eventually impressed by the complete absence of systematic looting and violence which many had fully expected. The one factor which had an immediately noticeable effect on the people of Japan was the spontaneous generosity of the Americans. were made in every town and village to revive the study of the language.75 Specifically, the police advised the Japanese to stop worrying, to disregard rumors, and to report to the police all problems arising between Japanese and foreigners.76 Newspapers, using a well worn Japanese method, warned that the eyes of the world were upon Japan and that calmness was to be maintained.77 One newspaper, blandly assuming that "...coquetry is the cause of trouble..." warned women against the use of heavy lipstick, rouge and eyebrow pencil. It also urged Japanese to be cautious of the type of English used on the streets. "Do not loiter in the streets nor follow the troops, and do not try to purchase anything from soldiers...." was probably its most significant advice.78 Yomiuri and Tokyo Shimbun were the most consistent of all Japanese newspapers in warning Japanese women against improper costumes or behavior.79 After cautioning girls against walking unattended even in the daytime, Yomiuri added: "Even when called upon by foreign soldiers saying 'hello' or 'hey', inter-mingled with their broken Japanese, women will pay no attention and will avoid all contact with them. "80 The press and the people alike were soon to learn that even in the few instances when women were molested, the offenders were punished. Washington suggested that restrictions should be placed upon associations of Occupation personnel with the Japanese population only in the event that the Occupation authorities considered such restrictions necessary.81 General MacArthur, who had lived in the Orient. for many years, was reluctant to make an issue of a delicate problem. The subject was therefore handled with tolerance, restraint, and discretion. Recognizing early that restoration of good relations depended largely upon the correctness of Japanese behavior, and that this in turn called for proper understanding of American psychology, Japanese newspapers stressed the need for promoting good relations. Lack of information concerning American ideals and methods was cited as a chief obstacle in promoting mutual confidence.82 Although this was a complete reversal of form according to their former pronouncements, it was not too surprising. The Japanese psychology was quite pliable where their country's future was concerned. clubs, and other facilities, providing a variety of supervised recreation for Occupation personnel. By the end of September, Japan's defeat had become a reality to her people. For the first time in her long history Japan had become a nation completely dominated by a foreign power. 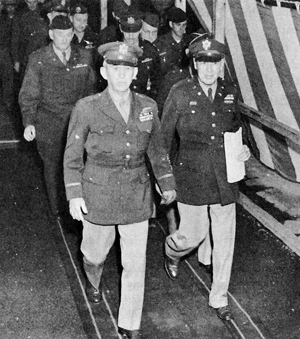 The firm hand of General MacArthur was controlling and guiding the Japanese nation and the people seemed responsive and cooperative. The large task of demilitarization of factories and resources had begun. War criminals were being arrested and held for trial. Ammunition, weapons, and other military material were being moved to depots to be inventoried and eventually destroyed. All these things the Japanese people had initially accepted, and continued to accept submissively, if not favorably. Hardly had the troops reached their objectives, when extensive movements of high point troops to the Zone of Interior began a second phase of Eighth Army movements within Japan. 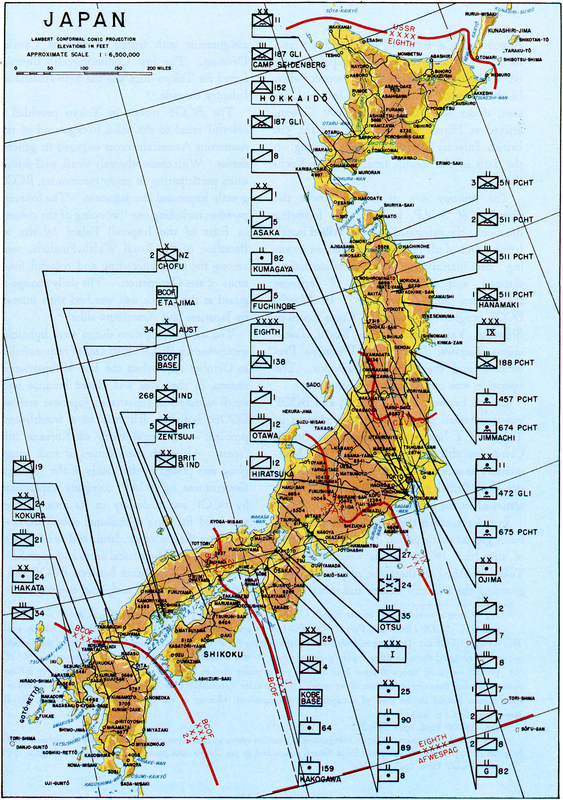 The Americal Division relinquished control in Tokyo and Kanagawa Prefectures (except Yokosuka Naval Base area) to the 1st Cavalry Division, and in Yamanashi Prefecture to the 97th Division. The 97th Division also relieved the 27th Division in Niigata and Fukushima Prefectures and assumed operational control of the 158th Regimental Combat Team in Tochigi Prefecture. The 1st Cavalry assumed responsibility for Yamanashi Prefecture, formerly under the 97th.86 Closing its long Pacific campaign record, XIV Corps returned to the United States with the 27th Division in December. In January, the 11th Airborne Division took over the northern tip of Honshu, relieving the "Wildcats" (81st Division). Its control was further extended in March to include Hokkaido, thus relieving the 77th Division. There was no difficulty in procuring billets and office space during the initial occupation. The 11th Airborne Division took over barracks vacated by Japanese soldiers. For several days, the paratroopers and the 1st Cavalry men moved from one installation to another in their respective assigned sectors and occupied whatever space was available. But with the arrival of additional troops and the heavier concentration of forces in the half-gutted Tokyo-Yokohama area, the problem became acute. Beginning with a mere handful of men late in August, the Eighth Army moved three corps, seven combat divisions, and supporting service troops into Japan within less than a month. By October a total of 232,379 Eighth Army men were in the country.92 The Sixth Army in its zone of responsibility had an approximately equal number. However, this was the high water mark and already the tide was turning the other way. It was apparent to careful observers that the capitulation of Japan was as comprehensive as it was real. Consequently, General MacArthur's mid-September estimate that an army of 200,000 would be adequate to garrison the islands was now widely acclaimed. I have noticed some impatience in the press based upon the assumption of a so-called soft policy in Japan. This can only arise from an erroneous concept of what is occurring. The first phase of the occupation must of necessity be based upon military considerations which involve the deployment forward of our troops and the disarming and demobilization of the enemy. This is coupled with the paramount consideration of withdrawing our former prisoners of war and war internees from the internment camps and evacuating them to their homes. Safety and security require that these steps shall proceed with precision and completeness lest calamity may be precipitated. The military phase is proceeding in an entirely satisfactory way. Over half of the enemy's force in Japan proper is now demobilized and the entire program will be practically complete by the middle of October. During this interval of time safety and complete security must be assured. are not soft and they will not be applied in kid-gloved fashion. Economically and industrially, as well as militarily, Japan is completely exhausted and depleted. She is in a condition of utter collapse, her governmental structure is controlled completely by the occupation forces and is operating only to the extent necessary to insure such an orderly and controlled procedure as will prevent social chaos, disease and starvation. The over-all objectives for Japan have been clearly outlined in the surrender terms and will be accomplished in an orderly, concise and comprehensive way without delays beyond those imposed by the magnitude of the physical problems involved. It is extremely difficult for me at times to exercise that degree of patience which is unquestionably demanded if the long-time policies which have been decreed are to be successfully accomplished without repercussions which would be detrimental to the well-being of the world but I am restraining myself to the best of my ability and am generally satisfied with the progress being made. The inconsistencies of armchair strategists, clamoring for repressive measures while weakening U. S. troops through accelerated demobilization became obvious in all theaters. Fortunately, General MacArthur's accurate psychological appraisal of the Japanese system enabled him to handle a contradictory situation. It was possible to utilize the Japanese government structure to the extent necessary to prevent complete social disintegration, insure internal distribution, maintain labor, and prevent calamitous diseases or wholesale starvation. 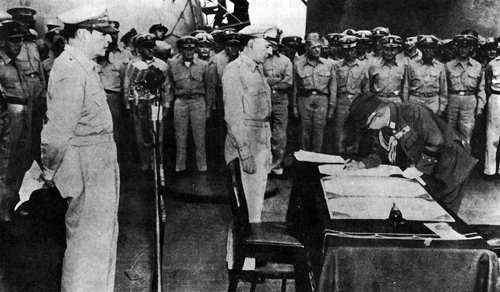 With the Occupation well under way it was General MacArthur's opinion that the purposes of the surrender terms could be accomplished with only a small fraction of the men, time, and money originally projected. Following the newly adopted Congressional policy of greatly reducing the armed forces, plans were developed for deactivation and redeployment. The result was that by the end of the year, General Eichelberger's command (Eighth Army) was under 200,00094 and was still going down. Meanwhile, the Occupation continued at an undiminished pace, quietly and efficiently. The first four months of the Occupation were also a period in which great changes were brought about in the social, political, and economic life of Japan.95 Beginning with the famous "Bill of Rights" directive in the second month of the Occupation, SCAP had issued a steady stream of orders to the Japanese Government designed to destroy those influences in Japan which had led her into war, and to establish a democratic form of government. Political prisoners were liberated; the secret police force was dissolved; Shinto religion was separated from the state; the Emperor renounced his divinity; women's suffrage was promulgated; the educational system was revised; trade unions were legalized; and scores of other political and social reforms were launched. All of this required supervision and surveillance on the part of military occupation personnel. internees, the establishment of Occupation facilities, and the disarming and demobilizing of the Japanese armed forces. From a military standpoint, the new phase would be concerned primarily with the maintenance of immediate objectives and the enter-ing upon long-range objectives of the Occupation. Both would be accomplished with a greatly reduced and constantly adjusting military force, yet one capable of meeting all emergencies, even combat, if necessary. The Air Force strength in January was listed at 30,799.101 The Fifth Air Force with its base at Irumagawa was charged with the responsibility for air operations in Japan; the Fifth Fighter Command, based at Itazuki in Kyushu, covered southern Japan ; and the Fifth Bomber Command, also at Irumagawa, controlled northern Japan. During January the largest single unit operating under Sixth Army was USASCOM- C102 which was originally the service of supply for Eighth Army under the old "Coronet"
operations plan. There were nearly 110,000 troops in this unit, the result of a merger of USASCOM-O and USASCOM-C (the respective "Olympic" and "Coronet" supply organizations of the Sixth and Eighth U. S. Armies). Inactivation of surplus units was undertaken immediately, particularly of those in the Kure area. Control of that region was transferred to the British Commonwealth Occupation Force at the end of January. USASCOM-C was concerned with the immediate improvement of water systems, housing, airdrome and hospital installations, and communications. Over-all communications traffic increased 30 percent in one month. Transportation problems increased as supplies en route for Sixth Army were diverted to the already overloaded Eighth Army ports.103 To handle these assignments in the face of rapid military reshuffling, the Army began to employ Japanese nationals. More than 2,800 of them were employed at the Yokohama central pier. Large quantities of supplies were accumulated because of the unexpectedly peaceful nature of the Occupation and the sharp reduction of troop strength.107 Although every effort was made to re-route cargoes which were not needed in the Theater, much of the incoming cargo had to be unloaded to withdraw needed items. After inventory and selection, the surplus supplies were referred to the Foreign Liquidation Commission of AFWESPAC for disposition. 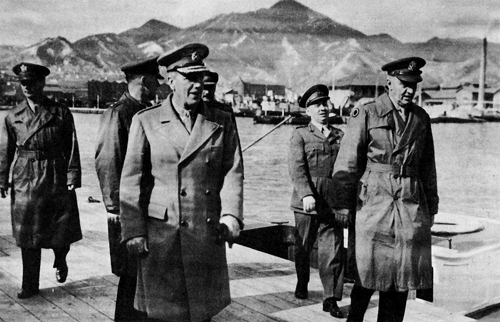 Lt. Gen. R. L. Eichelberger and Lt. Gen. H. C. H. Robertson, BCOF, inspect Kure dock area. British Commonwealth Occupation Force Headquarters. Iwakuni airfield in Yamaguchi Prefecture was made Headquarters of the BCOF Air Group, which was under the operational control of the Fifth U.S. Air Force. Air Vice Marshal C.A. Bouchier opened the headquarters of the British Commonwealth Air Group there on 1 March 1946. The following week, the 81st Wing, Royal Australian Air Force, flew in from Borneo. Other air units included the 14th Squadron of the Royal New Zealand Air Force which arrived on 24 March. By 24 April the preceding units were joined by the 11th and 17th Squadrons, RAAF, and the 4th Squadron, Royal Indian Air Force. August with a total of 36,154 officers and men.113 On 25 March the Occupation took on a distinctive international aspect when headquarters of the British and Indian Division, under Maj. Gen. D. Tennant Cowan, arrived at Hiro. On the same day the 5th British Infantry Brigade arrived, moving on the 24th of the month from Him to Kochi (Shikoku). 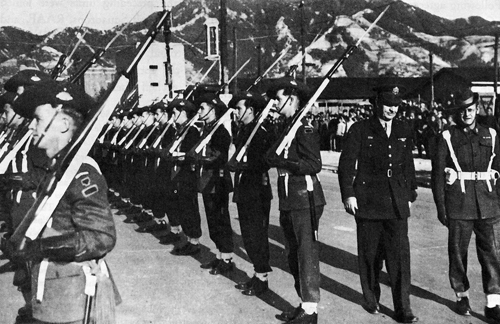 The military role of BCOF, under the direction of SCAP, included the following functions: the safeguarding of all Allied installations, and of all Japanese installations awaiting demilitarization; the demilitarization, disposal, and military control of Japanese installations and armaments.114 In March, BCOF progressively relieved I Corps troops in Shimane, Yamaguchi, Ehime, Kochi, Tokushima, Kagawa, Tottori, and Okayama Prefectures, and the island of Shikoku. The operation was completed by 10 June. Liaison between GHQ, SCAP, and BCOF was maintained through the establishment in Tokyo of a headquarters known as British Commonwealth Sub-Area, Tokyo. This headquarters became responsible for the administration of all British subjects, military and civilian, stationed in the capital. The Intelligence Corps of BCOF was made responsible for the disposition of enemy equipment. The one large disposal operation took place on Okuno Shima, where the principal Japanese chemical warfare arsenal had been functioning from 1925 to 1945. The elimination of dangerous chemicals and decontamination in this area, known as Operation "Lewisite," took over six months to complete. At the end of this hazardous operation, over 18,000 tons gross weight of war gasses and vesicants had been destroyed, and much valuable information had been collected on Japanese preparations for chemical warfare. personnel that much of this took the form of on-the-job training. Within ten months the bulk of these young draftees were replaced by Regular Army enlisted men, increasing the trend toward a more stabilized peacetime organization. From the military standpoint, local duties became routine. Except for guard duty and disaster relief work, the primary duties of a combat army disappeared. The Occupation pattern had developed sufficiently to have its characteristics remain fairly constant after 1946. The decline in strength of military forces was contrasted by the rise in the number of civilian specialists and other employees sent in from the Zone of Interior or hired locally to carry on the Occupation. Although the administration of the Occupation was still in the hands of the military, its operation became increasingly a function of the Japanese civil sections operating under General MacArthur in his capacity as the Supreme Commander for the Allied Powers.